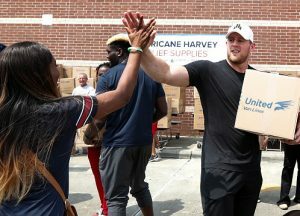 Houston Texans defensive end J.J. Watt released a one-year update on Hurricane Harvey relief efforts after he spurred a record-setting crowdsourcing campaign last summer. The storm caused extensive damage to parts of Houston and south Texas last summer. Donations have helped repair and rebuild over 600 homes and 420 childcare centers over the past year, according to a tweet from Watt. Funds have also supported the distribution of over 26 million meals to impacted individuals and medicine to over 10,000 patients. Over the next year, funds will go towards additional home restoration, rebuilding Boys & Girls Clubs, and supporting physical and mental health services. Watt’s foundation will work with organizations such as Americares, Feeding America, and Habitat for Humanity to facilitate recovery efforts. "As I reflect on the events of Hurricane Harvey one year ago," Watt wrote in an accompanying statement, "the memories of destruction and devastation remain, but they are accompanied by memories of hope, selflessness and the beauty of the human spirit. The actions of professional first responders and everyday citizens alike were an inspiration to the world and a shining example of the inherent good that lies within us all." "Moving forward, there will be more of the same, as we continue to work with our incredible nonprofit partners to provide as much help and support as we possibly can for those affected by Harvey," Watt continued. Watt initially intended to raise $200,000 for relief efforts, but his fundraising campaign ultimately received $41.6 million in donations, a world-record for crowdsourcing. He was awarded NFL's Walter Payton Man of the Year Award, which recognizes a player's contribution in his community and to society in general, for his work in the wake of the storm. Hurricane Harvey caused nearly $125 billion in damage, tying 2005’s Hurricane Katrina in terms of costliness. The storm damaged over 200,000 homes and apartments, and over 70 people died as a direct result of the storm.